​​​​​ HOUSTON – A 37-unit mid-rise condominium project is underway at 4819 Caroline St. on an empty half-acre lot in the Museum District. Construction began May 2018 on the $12 million Museum Blvd project, which is expected to be completed fall 2019. 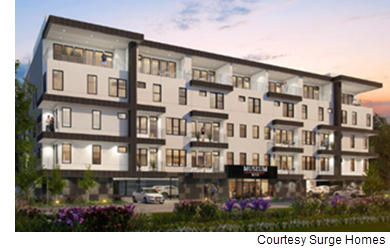 After preselling more than 50 percent of the condos, locally based Surge Homes secured construction financing to build the development. The project offers one- and two-bedroom condos as well as two- and three-bedroom, two-story penthouses, all ranging from 600 sf to nearly 1,700 sf. Museum Blvd's prices start from the $220,000s and go up to the $500,000s. ​Check out Houston-The Woodlands-Sugar Land Housing Market Research​.